Here are the most of the influential accordionists and singers who put Tejano Conjunto and Norteño on music on our musical map! From its humble rural beginnings with the "father" of this lovely regional music, Narciso Martinez (who started to record in 1936), we take you into the 1970s and beyond! Listen to Pedro Ayala, Paulino Bernal, Tony de la Rosa, Valerio Longoria, Flaco Jimenez, Eugenio Abrego (Los Alegres de Teran), Pedro Ybarra, and many more bring you their unique interpretations of Polkas, Rancheras, mazurkas, waltzes, and the many other varied regional dances. Since most (though not all) of these 21 conjunto tracks were previously issued on Arhoolie CDs and LPs, this has the dual purpose of serving as a sampler of Arhoolie's conjunto catalog and -- because Arhoolie has been one of the most active labels in documenting conjunto -- a good overview of conjunto music itself. 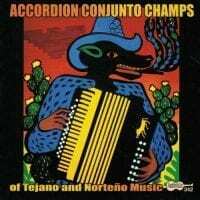 As the title lets you know, the accordion figures prominently in all of the selections, which includes some well-known legends of the genre (Narciso Martinez, Flaco Jimenez, Santiago Jimenez, Santiago Jiminez Jr., Esteban "Steve" Jordan) and several performers who'll be known only to conjunto aficionados. 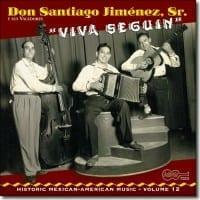 Because this spans several decades of recordings, and draws from numerous artists playing in various subgenres of this Tex-Mex style -- basing their songs on polkas, mazurkas, ranchera waltzes, cancion, danzon, cumbia, and other approaches -- it's a more interesting and varied survey of the music than listeners will get through single-artist anthologies. It's true that more information (particularly on original recording and release dates) could have been supplied in the skeletal liner notes, though these at least point curious listeners toward books and films that go into the world of conjunto in more depth. 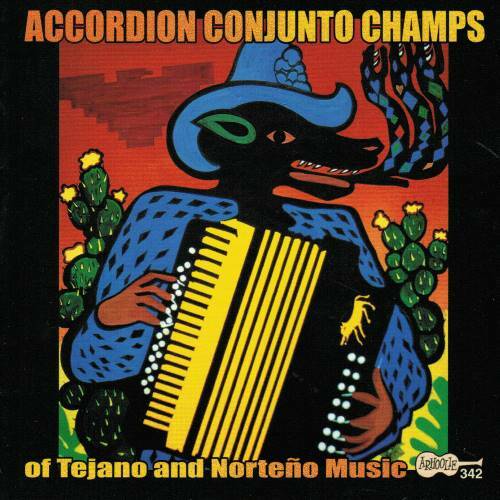 For all its scope, the alternately peppy and melancholy melodies of these accordion conjuntos can still sound pretty similar in mood taken all at once, with some of the wider detours from the usual format (like Paulino Bernal's "Cuando Bebo," which has mournful close female harmonies from Carmen & Laura) supplying welcome spice. One of the tracks, Fred Zimmerle's "Al Cortar una Gardenia," was previously unreleased. "Perhaps more than any other nationally prominent label, Arhoolie has gone above and beyond in its quest to record and reissue legacy conjunto music. It has helped preserve an essential cultural element and is viewed as the source by upstart musicians wishing to dig at the roots a little deeper. This 21-track collection is a splendid way for anyone wishing to be introduced to norteño, as it's call south of the border, or conjunto, as it's known in the north. With most selections stemming from the formitable 40s through the 70s, be forewarned, it's not exactly an introduction but an immersion, with such heavyweights as Santiago Jimenez Jr., brother Flaco, and father Santiago Sr.; Paulino Bernal; Tony De La Rosa; and Narciso Martinez, the father of conjunto. There are a few underdogs here, too, with Fred Zimmerle, Pedro Ybarra, and Leonardo Guerrero. Together they cover an expansive amount of territory with their stylistic finery and scintillating polkas, mazurkas, rancheras, huapangos, danzón, schotis, cumbias, and even a guaracha. Many are instrumentals, a few are canciones (songs), yet all are enjoyable, and you don't have to swallow the worm to prove it. "